The chart above (thanks to Olivier Ballou) is an update of a chart we produced last year about this time, and shows the percent changes since January 1997 in the prices of selected consumer goods and services, along with the increase in average hourly earnings in this version … Blue lines = prices subject to free market forces. 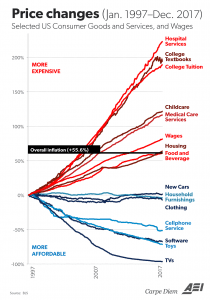 Red lines = prices subject to regulatory capture by government. Food and drink is debatable either way. Conclusion: remind me why socialism is so great again. The example Baumol and the late William G. Bowen made famous is that of the string quartet. The number of musicians and the amount of time needed to play a Beethoven string quartet for a live audience hasn’t changed in centuries, yet today’s musicians make more than Beethoven-era wages. They argued that because the quartet needs its four musicians as much as a semiconductor company needs assembly workers, the group must raise wages to keep talent—to keep its cellist from chucking a career in music and going into a better-paying job instead. 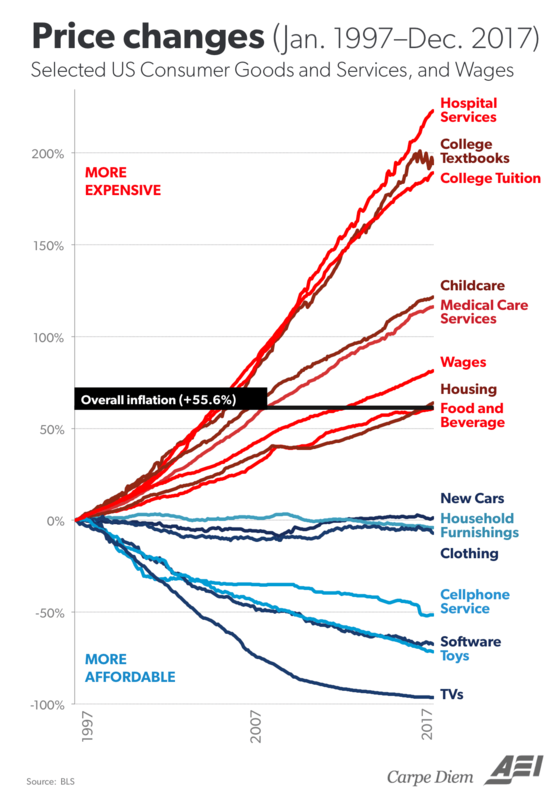 The effect now known as Baumol’s Cost Disease is used to explain why prices for the services offered by people-dependent professions with low productivity growth—such as (arguably) education, health care, and the arts—keep going up, even though the amount of goods and services each worker in those industries generates hasn’t necessarily done the same. Mark Perry is the prime example of why I would never hire a graduate of GMU economics department. Just think of all the bad knowledge he has that you would have to un-teach him. We can post the chart if you like. It is sitting in AB’s Media area. I did not put it up as it is your post. I am certainly not going to defend Mark Perry’s arguments. And Baumol’s ‘cost disease’ argument seems reasonable to me. Of course it doesn’t explain how those quartets and other labor intensive endeavors are to be maintained as going concerns. In Mark Perry’s chart, all of the items with 0% prices changes are those which can be produced in another country and shipped into the US. How are we to maintain a diverse economy when we allow free trade to cause the jobs with the highest productivity to be moved out of the US? If you are able to do so – that would be great. Jim H – nice contribution! Ergo, according to Perry, String Quartets= Socialism. Got it. All laissez-faire proponents believe gov’t (excepting perhaps — only perhaps — defense spending) is socialist. It’s axiomatic. PGL has never heard of Luddites. Industries captured by well-paid greedy protectionists scum that reject technology and still do things the way they did decades ago. Jay – I am well aware of Luddites and trade protection. But that does not explain Perry’s data. But nice try as you troll on! Certainly discredits your worthless explanation of the data. Maybe you “think” you understand Luddites but you have it all wrong. Jay – it does not discredit anything. Alas – your trolling completely misses the mark. Move on. The jobs only move out of the US because foreign competition produces the product for less including transportation costs. That means US invested dollars aren’t being used to compete by greater productivity gain to compensate. The reason US investors don’t invest in greater productivity gains is because the alternative investment opportunities return greater ROI and that ROI has to be competitive with US company profit rates, which are greater than those required by foreign producers. On top of that fundamental economic factor is that U.S. tax policies incentivize US capital invested offshore — because of course profits offshore can be and are reinvested offshore to increase their offshore profits. But the U.S. chose to not tax those profits unless and until they are returned to the U.S.
And to top that off, the capital owners capture of congress has then allowed those profits to be returned at for lower tax rates at intervals of time (when the GOP is in power) making it even more lucrative to invest offshore for even greater profits. And the major offshore investments occurred AFTER corporate tax rates were reduced (Reagan’ “trickle down”) via long term investments on unearned income being taxed at 20% instead of at standard income rates, which further incentivized offshore investments and greater domestic profits. Hence this further reduced US competitiveness relative to foreign producers. It’s a downward spiral. Charging tariffs for imports only reduces U.S. competitiveness more which simply accelerates the downward spiral. In the end analysis you either compete or you lose. If you want to compete on labor costs then the U.S. just drives down it’s own standards of living, which is to say the lower 90% of incomes.. If you want to compete by reducing Corporate taxes, then U.S. revenue losses either force greater deficits or reductions in U.S. benefits which is just another way of reducing standards of living. Besides in that case foreign producers just reduce their tax rates on foreign producers in their nation’s anyway, or provide greater incentives to invest in them… either way reducing U.S. corporate taxes doesn’t do anything but increase capital owners profits making it even less lucrative to invest in increasing productivity rather than alternative investments that return greater ROI..
U.S. heath care, Housing, Child Care, etc… all of which are constrained to domestic consumption with no foreign import alternatives.. This includes hospitality, restaurants, retail (brick/mortar) and other low wage domestic only consumption. Interestingly infrastructure investment which is also a domestic only condition has NOT been invested in — primarily because these are publically owned not-for-profit benefits providing much of our high standards of living. Unfortunately however, the conservatives in congress and States block those public investments… of course because they mean higher taxes on private capital owners and don’t provide the degree of profit in direct near term accounting terms to them either. 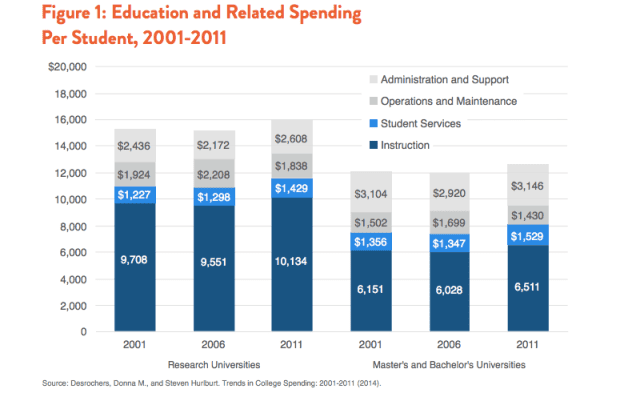 Most of the rising costs of college education and hospital care revolve around the profit motive. They are essentials that have managed to avoid nationalization, so they are much more expensive in the US than in other countries where the government heavily regulates their pricing. Both have been subject to increased management overhead and bureaucratic empire building. These can happen in socialist countries, but the taxpayers rebel. With our private sector and naive belief in the benevolence of capitalism, we have no such recourse. I will add to this and say the increased cost of financing an education has added to this herculean effort to gain an education. Interest rates for student loans are ridiculous with people such as Akers, Chinagos, Delisle, etc. pushing for higher rates and privatization. Obama kicked private student loan lending to the curb; but, Congress has allowed private interests such as Navient, Sallie Mae, etc. to service student loans with horrendous results. They are little better than loan sharks penalizing with double digit penalties and increased rates. 1 in 4 students with loans today are in default. The sum of all loans approaches $1.5 trillion. The IBR and Repaye programs are not working. The cost of many student’s education will last a life time. Loan funding of a college education should have interest rates no higher than 3%. Private Enterprise should not be a part of it. After a period of time, student loans should be forgiven. 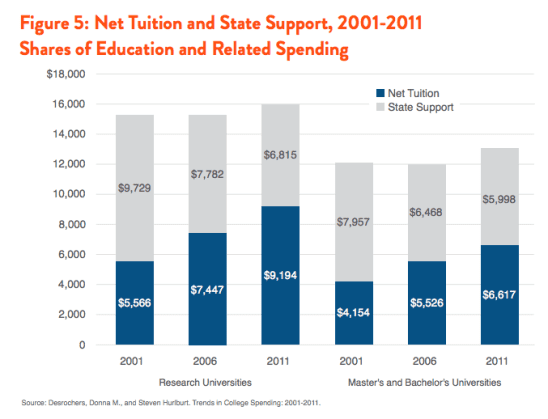 For Profit college education should not exist. I have no reason to believe this is much different now. 1.Vastly reduced public funding for it. 2.Continuing large increases in college attendance — which forces more buildings to be constructed, more overhead, more profs, & more admin. Combining #1 with #2 accelerates prices of attendance. It did not take a genius to understand that President Reagan’s tax cuts were a gift to the wealthiest Americans and their corporations. They quickly raised federal deficits. But President Reagan’s lowering of income taxes in the early 1980s did not cause the Great Recession in 2008. The Great Recession was brought on by Global Free Trade beginning in 1994. Global Free Trade killed off the last bit of bargaining power that labor had possessed, reduced the federal government’s income from tariffs, and gave corporations the power to dictate to the US government. In the late 1920s the new financial device was installment loans to purchase automobiles, and the new electrical appliances. In the mid 1990s the new financial device was poorly regulated private securitization of home mortgages. Americans could refinance their homes to pay off other debt. If you could fog a mirror then you could get a loan. Stagnant income was not a problem. Home appraisals kept pace with borrower’s desire for cash. You seem to be of the opinion that the only important factor for a product to be sold in the US is the lowest price. Trade deficits must be meaningless to you. I disagree on both counts. This experiment has failed. It has been responsible for higher consumer, business, and government debt! You made this up out of thin air Referring to my comments. “You seem to be of the opinion that the only important factor for a product to be sold in the US is the lowest price. Trade deficits must be meaningless to you.”. Just btw, trade deficits are a function of lowest prices … foreign import prices lower than domestic prices; export prices high relative to foreign products, reducing foreign purchases of US products..
My anecdotal experience with offshore investments (circa 1995-2000) is that they came as an attempt to gain offshore markets. As usual, success lead to more investment which eventually outstripped reality. It was the over-investment which lead to cutbacks, which did not fall equally on US and offshore manufacturing. Fortunately for me, I was able to find a new job. Notice the same chart was produced with a very different interpretation! Low prices, are you kidding me? Tariffs have been used since 1789 to drive up the price of cheap imported goods. The US had a robust thriving economy before all these free trade treaties. Poorer consumers in the US bought appliances and used cars. In 1993 Mexico was a poor country. What were poor Mexican consumers supposed to purchase from US manufacturers? China was a very poor country. Now we have excessive trade deficits with both of them. Are we to believe that the purchase of cheap trade goods is worth impoverishing working class Americans? That has been a poor bargain. The 15 years before 2008 were dominated by increasing foreign trade and almost stagnant real domestic wages. The result was debt, debt, and more debt! Then came the defining event of the last 25 years, the Great Recession of 2008. Here we are 10 years later and the recovery from that event has been so dismal that the Federal Reserve has still not returned interest rates to what they were in 2007. The Effective Fed Funds Rate is a pathetic 1.4% instead of the 5% in August 2007. They are afraid and their fear is rational. I already described the negative impact of tariffs on US competitiveness. Read my comments.. The input on the FED rate is more than a little confusing. I don’t think Baumol has captured it all. Calling it a disease seems to color an effect as a negative. The effect sounds like what is often accredited to the level of unionization we had for a while 36% or so causing labor wages to rise across the board. But, what is drastically different post 1980 is the shift of wages away from productivity gains. Once labor of manufacturing (that good old assembly line thing boosting productivity) was broken from the 1 to 1 tithing, other labor will certainly start to look comparatively expensive especially if the task at hand is not amendable to simple productivity gains. Musicians is not the best sector to choose as an example of this Baumol effect as musicians and artist in general were never considered “good” even blue collar jobs. But, some artist (musicians) being unionized could make a blue collar living. Few just got lucky. As it relates to the nations standard of living, increasing productivity allows more people to purchase thus driving ever greater growth for the company. At least that was how it used to work. But, that takes ingenuity and that is work. Far easier to change a few rules, buy a few politicians and then buy out your competitor, and bingo I have greater sales. Off shore the whole thing and collect royalties/rents and it’s even easier. What? You laborer can’t make ends meet?